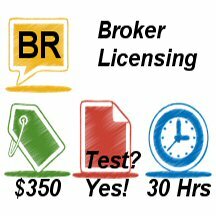 This is a Pennsylvania State Real Estate Commission course required to obtain a Pennsylvania real estate broker license. Managers in today’s real estate companies are challenged by the way the industry is evolving. This course applies modern management theories to operating a real estate company. It focuses on effective leadership and management styles, as well as planning, organizing, staffing, directing and controlling the sometimes complex systems and processes of a brokerage with both employees and independent contractors. The course covers the changing financial and operational environment in which brokers now work, the leadership needs of emerging brokers, people management skills, communications and decision making; conducting and assessing an analysis of markets and business environments, and developing a plan for success in both; structuring the brokerage company, its business systems, finances, policies and procedures, and marketing and advertising; and dealing with the practical and legal realities of staffing a brokerage office. It is categorized as Pennsylvania State Real Estate Commission-required. See the Polley Associates free Pennsylvania Broker Guide for more information.